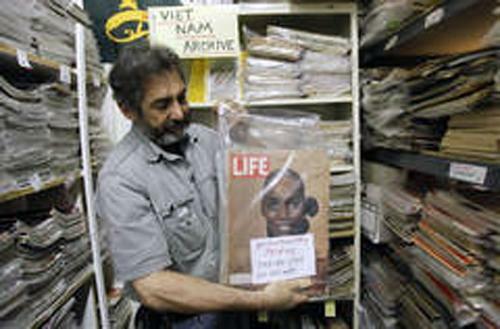 Bob Katzman pulls out an issue of Life magazine in his store Magazine Museum. Katzman sells antique periodicals, posters and newspaper front pages. Telephone wires zigzag through the air above, train tracks run perpendicular to the street and cars rumble on nearby Skokie Highway, yet Magazine Museum remains silent in the midst. It is as if someone has pulled Harry Potter’s invisibility cloak over the store hiding it from public view, Magazine Museum owner Bob Katzman said of his journalism-themed store, 4906 W. Oakton St., in Skokie. Inside, periodicals are stacked on bookshelves running along the walls, creating skinny avenues through which customers are expected to squeeze. Marilyn Monroe coyly smiles in a poster and Jimi Hendrix poses on the walls on historic Rolling Stone covers. The Magazine Museum includes 4,000 issues of the New Yorker, Time magazine articles dating back to the 1920s and a collection of 200 international flags. Periodicals are stacked together in categories such as naval disasters, the gay rights movements and the civil rights movement. Despite the many magazine covers and newspaper front pages blaring moments of history that deeply resonated with Katzman, such as John F. Kennedy’s 1963 assassination, which sparked his interest in periodical collecting, he spends most days alone at the Magazine Museum without any customers to cater to or share his love of America’s editorial past. Only a picture of his family keeps him company. He said that he has stopped accepting orders from people trying to sell him periodicals because he’s fully stocked and hasn’t needed to replenish his inventory. Katzman had expanded his efforts to stay afloat as a small business owner by promoting the store at nearby colleges such as Oakton Community College, DePaul University and Northwestern, where he passed out flyers and attempted to advertise on the school radio station, WNUR. However, he said he has seen neither an increase in interest from the surrounding university communities nor that hoped-for spike in business for Magazine Museum. Katzman said he has yet to hear from the store’s Facebook fans and the wide audience he reached out to on radio shows such as Loyola University’s WLUW radio station. Katzman moved his business to Skokie three years ago and changed its name from Magazine Memories to Magazine Museum. “Museum” impresses a more timeless quality upon the store’s goods, but news consumers and creators share a widespread sense that the print news industry is a thing of the past. Medill Prof. Loren Ghiglione said the doubtful future of journalism is in part due to the new challenges contemporary media must face, such as creating content that is appealing to a younger audience with shorter attention spans while maintaining a sustainable business model. A recent study from the Pew Research Center predicted that a growing trend of newspapers will join the 150 that have moved to digital subscription format, or charging for online content. Among NU courses designed to address the growing trend toward a changing media industry is Medill’s Introduction to 21st Century Media, in which students study the dissemination of news through social media platforms such as Twitter and Facebook. The course was formerly known as History and Issues of Journalism. “This is an exciting time because I have the feeling that change will accelerate and certainly remain constant at a high level,” Ghiglione said. Katzman said that he is not sure of what to expect for the future of his business in a dynamic world dominated by multimedia. The recession room he created at the back of his store acknowledges people’s economic hardships, but it remains unused he said.